Nursery School Karlsons was built within a public-private partnership project. It is one of the first projects of this type in Latvia. Within the same Project, Cleanhouse already carries out management of Nursery School Bitīte in Ķekava. Cleanhouse will manage Nursery School Karlsons for the next 19 years (until 2030) acting as a member of general partnership ACANA. 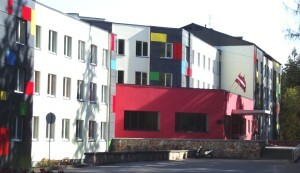 Nursery School Karlsons in Tukums is one of the most recently finished buildings in the region. In total it can admit 136 children in six groups aged from three to seven years. The total area of this building is 2.100 m2. Linstow Centre Management is a pioneer of shopping mall culture in Latvia. Linstow works in Latvia since 1998 and since than it has become the most experienced, professional and successful developer of shopping malls in the Baltic States. Linstow has developed five shopping malls in Latvia – Alfa, Mols, Galerija Centrs, Origo and Dole, as well as the largest shopping mall in Estonia – Ülemiste. Galerija Centrs is one of the historically most significant buildings in Riga, which serves as an active and successful trade site already since 1938. Years have passed by and this trading place has still preserved its unique status of Riga public life symbol. From October 2011, Cleanhouse will provide daily cleaning for this central shopping and relaxation center in Riga City. Cleaning area: facilities – 11.300 m²; territory – 1.650 m² . Starting from the beginning of school year 2011, Cleanhouse carries out management of room cleaning in Ogre State Gymnasium and recently renovated Primary School building with the total area of 11.200 m2. • operative service (emergency service 24/7/365).